"Over the last five years I have used Footprint Leaderships services for a number of selected high performers on my leadership teams. Ranging from new management roles to Vice Presidents, Jamie has had made a significant impact on all of their personal effectiveness and leadership skills. "Some of them have experienced truly transformational changes and all of them have had noticeable behaviour changes or strengthened leadership effectiveness in the workplace. I see Footprint Leadership as a secret competitive weapon that has truly helped me build one of the strongest leadership teams I have had the pleasure to lead." Do you wish you could get the best from your high-potential talent faster than you are now? The good news is you can get outstanding results from your future leaders faster and easier than you think. Footprint Leadership specializes in developing new and emerging leaders. My clients are often more established organizations beginning to deal with the reality of an aging leadership population in their company, fast-growth companies struggling to keep up with demand or simply progressive organizations who appreciate the value good leadership brings to the table. If you’re in a similar situation, you may be struggling to find the time and energy needed to get your next generation of leaders up to speed fast. Close performance gaps promptly and effectively. Create highly loyal and productive talent quickly. Have a deeper bench of talent to seize profit opportunities. Give your top talent the tools and support they need and deserve. Make it easy for senior leaders to focus on driving the business. For many companies that have secured my services including 1:1 leadership coaching, coach training for managers or keynote speeches their emerging leaders create dramatic results such as sales increases of up to $250M, product lines now making 8-digit profits and company branches skyrocketing in effectiveness, among others. 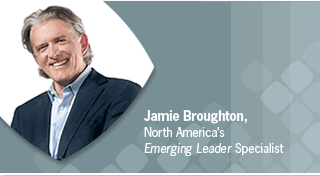 Hi, I’m Jamie Broughton and I’m the founder of Footprint Leadership. Yes, it is possible to develop your high-potential talent faster than you think. If you’re looking for a proven approach that gets people up to speed quickly while producing tangible business results, you’ve come to the right place. I’ve helped hundreds of new and emerging leaders be more effective at what they do since 2000. Without exception, participants report a dramatic increase in their professional effectiveness and a deeper passion for their work. I have a solid track record of success that proves my approach works. In fact, my book about Emerging Leaders has been endorsed by business schools, thought leaders, talent management professionals, business leaders and best-selling authors alike. The approach can work for you as well. You can begin creating more effective leadership now by getting a free excerpt of my book, The Emerging Leader: Identify, Ignite and Retain Your Company’s Next Generation of Leaders. It’s filled with unconventional ideas and detailed steps on increasing the effectiveness of leaders more quickly and easily. The excerpt is bundled with my popular international leadership newsletter, Footnotes. Just fill in your first name and primary email address below to get started. A few moments later you’ll receive an email with The Emerging Leader excerpt. That’s all there is to it. We never rent, trade or sell your email. Ever. Once you’ve received your excerpt, click here to find out more about the kinds of companies and situations that benefit most from my leadership coaching services.